Register at Point Michaud Beach during class time. Lessons cancelled on days of extreme conditions or weather. There will be no programs or rentals on Mondays and Tuesdays. Clubs include surfboard and wetsuit, with land and water instruction. Surf Club activities will vary depending on weather and tides. Please call 902-587-2988 for an update on surfing conditions. Lessons are a half hour of equipment familiarization andland lesson, plus 1 hour of surf instruction in the water. Includes surfboard and wetsuit with instruction. 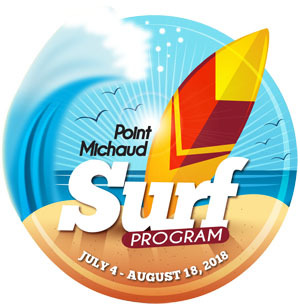 Point Michaud Surf Classic, Point Michaud, August 18. Contact 902-587-2988 for more information.